Watermelon Season! - Fit, Healthy and Fabulous! It is that time of the year again! Watermelon Season! Sweet, juicy and packed with healthy benefits. The health benefits of watermelon are plenty, it packs a punch of vitamins A and C and has a good amount of vitamin B6, potassium and magnesium just to name a few. Vitamin A – for optimal healthy eyes, it boosts your immune system by enhancing the infection-fighting actions of white blood cells called lymphocytes. Vitamin B6 – helps your immune system produce antibodies, these antibodies are needed to fight off many diseases. Vitamin B6 helps maintain normal nerve function and form red blood cells. Vitamin C – helps to boost your immune system’s defenses against infections and viruses, and protects your body from harmful free radicals that can accelerate aging and eye conditions such as cataracts. Vitamin C helps keep your skin young, hydrated and healthy too! 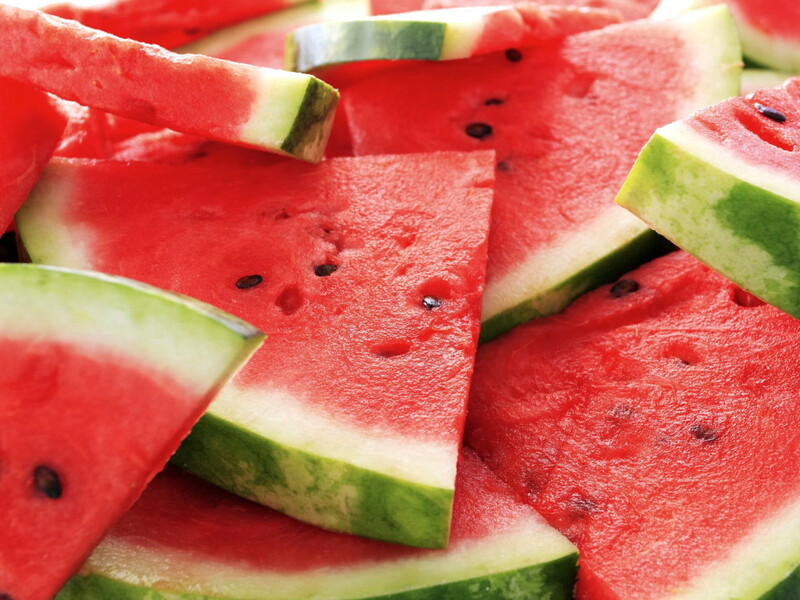 Just two cups of watermelon is a great source of potassium, potassium is a mineral necessary for water balance and is found inside every cell in your body. People that have low potassium levels often experience muscle cramps. Ever get those leg cramps that wake you up at night? Try eating watermelon or a banana daily! My favorite way to eat watermelon, is to put it in the blender and make a watermelon water, just cube it and blend, it is healthy, refreshing and filling too. *Look for a firm, symmetrical watermelon that is free from bruises, cuts or dents. *The watermelon should be a bit heavy for it’s size, watermelon is 92% water and most of that weight is water. *The bottom of the watermelon should have a beige/yellow colored spot from where it grew on the ground and ripened in the sunshine. Have a great summer and be sure to go to the local farmer’s markets in your area and enjoy all the fresh produce of the season! This entry was posted in Beverages and Smoothies, Healthy Food and Recipes and tagged Health and Fitness, Healthy Food Choices.